Vega is a visualization grammar developed by the folks from Trifacta(some history). You can have a brief idea of the idea of Vega in just one minute going to this online editor, which will map the json syntax to its corresponding virtualization. What is more, the community has also developed Python package Vincent to make Python plot beautifulsoup d3 quality graphs with Vega running behind the scene. I installed Anaconda Python on my Ubuntu box since pandas is a dependency for Vincent, which Anaconda ships with pandas. There are hundreds of warnings while I was doing `sudo pip install vincent` and it also took me a 10+ minutes pausing now and then, in the end, it will finish, FYI. 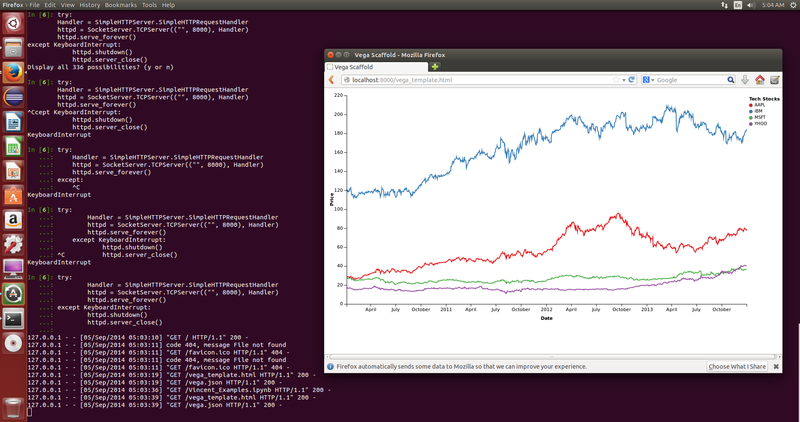 But at this moment, I like Shiny + rCharts + ggplot2!